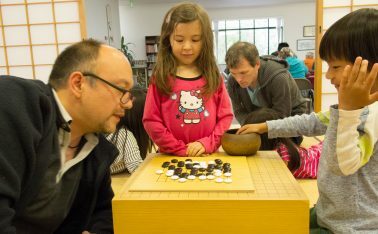 The Seattle Go Center supports Go Clubs in the schools, and organizes up to three Youth tournaments a year. This is in addition to teaching young players for free at the Center on Tuesdays from 3:00 to 9:00 p.m. (walk-in), Thursdays 6:30 to 8:30 p.m. (class for children and adults), and Saturdays 1:00 – 5:00 (walk-in). Children are welcome in our Paid Private Instruction Program, which provides private lessons on Fridays, Saturday mornings, Sundays, and other times when we are not open to the public. More information on the Paid Private Instruction Program is available on the paid instruction page. We also do class visits during the school day. For example, we visit the University Child Development School for several classes each year. The Go Center has sponsored a Go club at nearby McDonald International Elementary for many years. The club meets on Thursday afternoons in the fall and winter as part of the McDonald After School Program. Brian Allen is the lead teacher. Ben Resnick and Peter Kron also teach. One of our volunteers, Sonny Cho, is teaching two classes at the Northwest Chinese School at Newport High School in Bellevue on Saturdays. David Snow, one our Directors, helps him out. Our club at Challenger Elementary school, in the Issaquah School District, meets in the winter and spring after school on Wednesday. This club was started up by Bill Mokin, a teacher at Challenger. 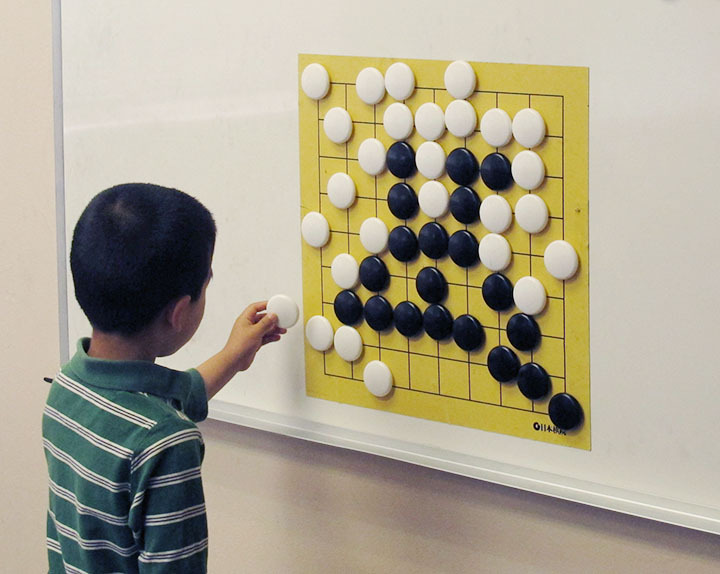 Two Go teachers, Peter Kron and Jason Pogue, are from the Seattle Go Center. 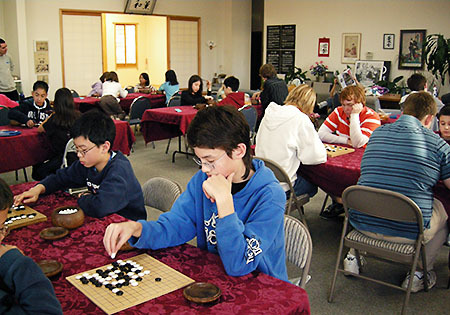 Other schools that have had Go clubs in the past include John Stanford International (Seattle), Sacajawea Elementary (Seattle), Hamilton International Middle School (Seattle), Roosevelt High School (Seattle), Forest Ridge School of the Sacred Heart (Bellevue), Meadowdale High School (Lynnwood), Kimball Elementary (Seattle), the Evergreen School (Shoreline), and the Seattle United Korean School (Bellevue). The Go Center is very interested in starting up more school go clubs. We find that this process usually this takes two leaders – a Go instructor and an in-school organizer. We can usually provide the instructor from among our Go Center staff and volunteers, but it is best to have a Go club organizer who is already involved with the school. They will be much better at publicizing the club than we can be. The organizer might be a parent, teacher, staff member, or older student. They do not need to know how to play Go; willingness to contribute some time to starting a Go club is sufficient. In addition to providing an instructor, the Go Center can provide starter equipment, and help with after-school program applications, including providing insurance, business license and a budget. Since we are a 501(c)(3) public charity, we can also do fundraising, pay instructors, and pay employment taxes.